Healthy Fats in Every Bite! I made these Almond Cacao Energy Balls kind of on a whim over the weekend and I am so glad I did! I think they might be the only reason I am keeping with Chad and our running and lifting schedule. If you've been following my blog for a while, you've probably have heard me talk about my love/hate/hate relationship with running. I played soccer my entire life and it wasn't until my ACL injury that I started to hurt every time I ran. I could never pinpoint where the pain was coming from, I just hurt. Well, as it turns out, I have very narrow and tight hips which leads to inverted femurs and achy knees. I'm in the process of trying new shoes, insoles, and just letting my body get used to it all. I will say, lifting 3-4 days a week on top of running almost every day is hard freaking work. Kudos to all of you who run some serious distance and strength train! If you have any advice for a retired newbie like me, be sure to let me know! On the other hand, I've got your back with these fat balls! Fats are essential for the body and play such a key role in almost everything our body does and can do. These dark chocolate truffles are rich, creamy, and look waaaay fancier than they should, but on the bright side, you can bring these to a party and people will think you're some kind of gourmet chef! Or maybe just a crazy "bird seed eater" like myself. 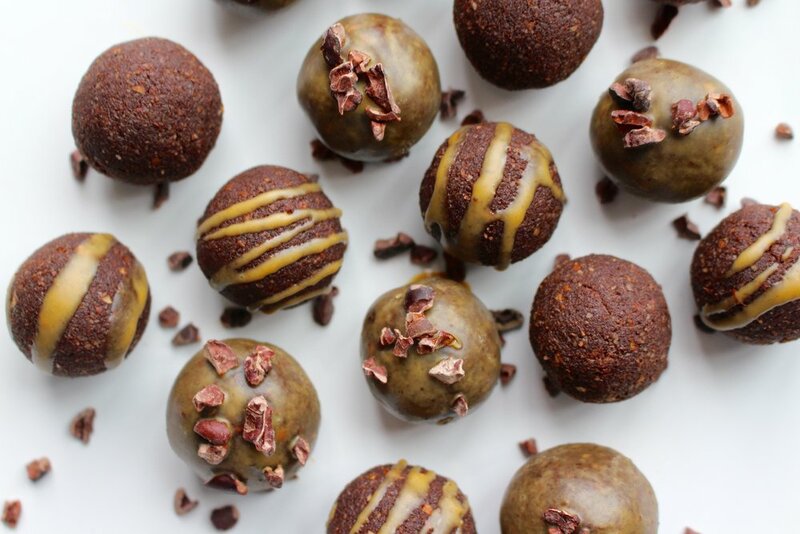 All you need for these balls is almonds, honey, cocoa powder, coconut oil, and your favorite nut butter! They are super easy to make, store, and grab when you're sweet tooth is talking to you. I hope you love them as much as we do! Start by adding the almonds, 1/4 cup honey, and cocoa powder to a food processor. Blend on high until little pebbles begin to form. Next, add in 2 of the 3 tablespoons of coconut oil (leaving 1 for toppings), and blend until the batter begins to come away from the sides of the processor. Once completely combined, roll into 1 inch balls. This recipe makes roughly 12-15 balls, depending on how large you roll them. In a microwave safe bowl, melt the remaining 1 tablespoon of coconut oil with 2 tablespoons of nut butter. This will create a glaze that will harden once cooled. Mix well and then drizzle or coat the balls in the nut butter glaze. Sprinkle with raw cacao nibs and let chill in the fridge for 15 minutes.